Black, pink and white button badge. This badge has the text EMO & Proud written in a typewriter style font. Were you or are you still part of the EMO scene. The emotional music, dyed black hair and sultry attitude. This was a movement that grew in popularity in the last 90's. 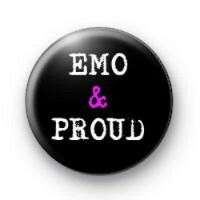 This is a great badge if you want a nod to your emo past or still love to embrace your emo lifestyle.